We think this unique collection from The Invite Guy would be perfect for those of you who see your body as an easel with which to display art in your own unique style. 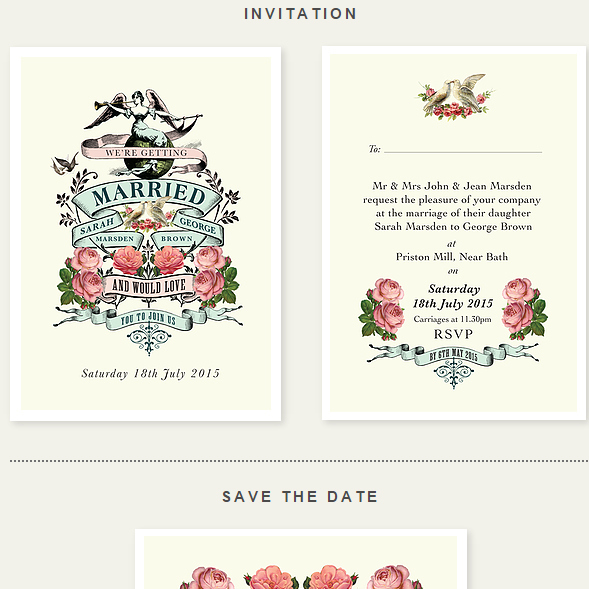 Tattoo’d couples and admirers of body art will no doubt love this range of wedding stationery! This design features a wealth of goodies which will keep your guests pawing over as soon as they open their envelope. Friends and loved ones will initially be greeted with an archangel blowing her trumpet as a sign of celebration atop her green globe as two birds frolic and rejoice with excitement. Below this they’ll spot elegantly illustrated foliage, two white doves nestled amongst several gorgeous rose blooms and of course the news that you and your soul mate have invited them to the biggest day of your lives which has been stylishly arranged on pink and blue scrolls. The reverse of the invite showcases all of the intricate details, of which you can decide upon to suit your requirements. The Bloomtastic range is totally customisable; you can change the type of paper stock, the colour palette and the wording so that the finished look seamlessly matches your wedding theme. With an extensive range of matching products to choose from, even including bottle labels, stickers and large framed invites, you can be sure that you’ll have a Bloomtastic wedding from start to finish! Tags: Cupid, Love Birds, Quirky, Roses, Shabby Chic, Tattoo.